Admittedly, in the past I was never a huge fan of camo print ANYTHING… but that’s definitely not the case today! I love how adding a piece like this jacket (wearing a size small) from Abercrombie gives off just the right amount of street style. With that said, camouflage is a very masculine print, so be sure to add accessories with pieces like this choker, and a pair of heels to keep from looking too boyish. Also if you are like me and wanting to tip-toe your way into the trend, keep things simple by wearing basics with a pop of camo. I opted for my favorite white cami (obsessed) and ripped boyfriend jeans. My jeans are from two years ago (sorry), but I found a great alternative here, and they happen to be on sale! I just ordered them because I saw them on another blog and they looked almost identical to the ones I’m wearing today. 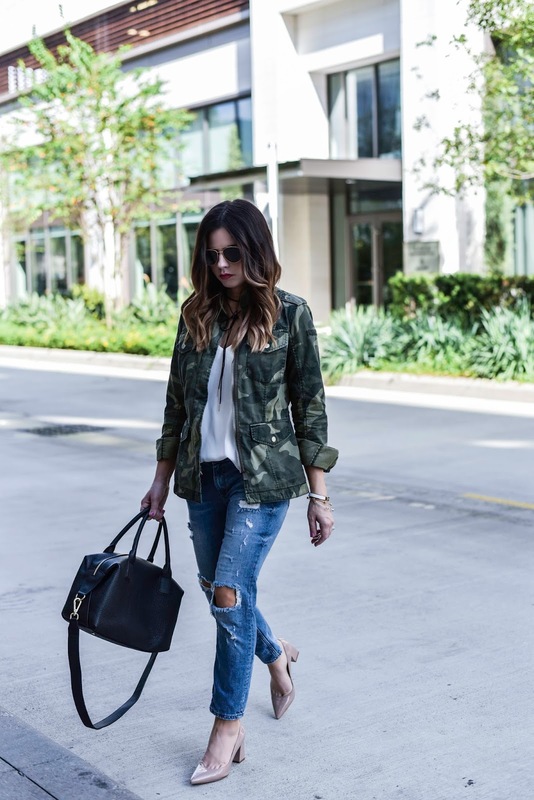 Loving the camo jacket – such a cool casual look! WOW! So elegant 💙 your style is always AH-MA-ZINNNG!!!!!!!!!!!!! Aw thanks! You are too sweet!